South Korean auto parts supplier Hyundai Mobis is striving to gain an upper hand in driverless technology, for which it will increase the ratio of investment in research and development to 10 percent of its auto parts revenue by 2021 from the current 7 percent, the company said Monday. It will also roughly double the number of professionals in autonomous driving from 600 people to over 1,000 in the cited period. “Among the technology Mobis is working on, we are particularly focusing our attention on obtaining driverless sensors, a key technology in automated driving that plays the role of an eye reading surrounding environment,” the company said. To self-develop crucial self-driving sensors -- radar, camera and lidar -- by 2020, the company is strengthening partnerships with overseas firms, academia and startups. It is aiming to mass produce five radars with 360-degree detection capability jointly with German radar developers SMS and ASTYX by 2021, it said. On a broader outlook, Mobis has set goals to commercialize level 3 and higher self-driving technology on highways, which does not require driver interference, by 2022. 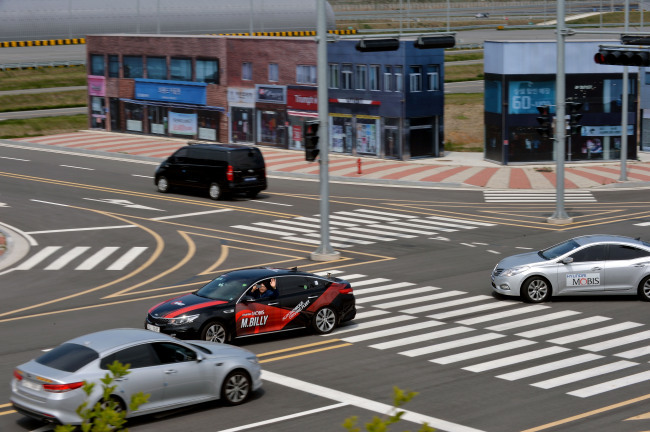 To test out various automated techniques, the company has also invested 300 billion won ($267 million) for a test bed for automated driving equipped with 14 test roads that is about six times the size of Yeouido, in Seosan, South Chungcheong Province, which opened in late June.